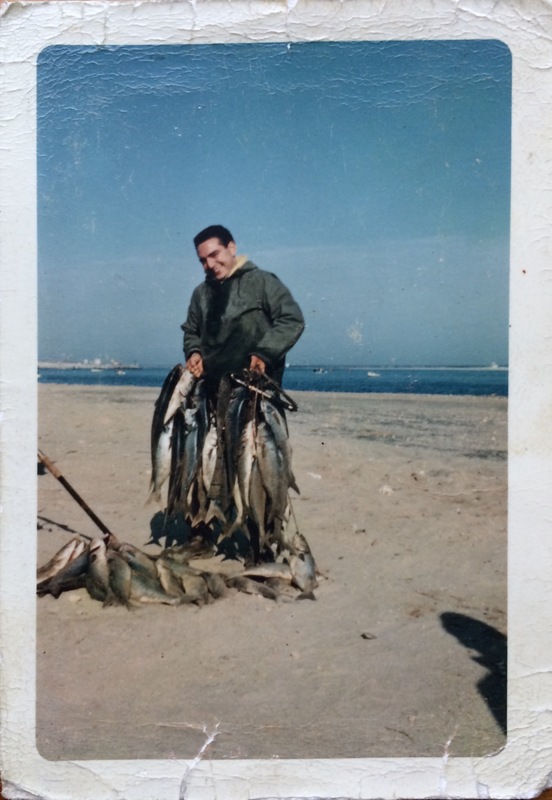 These fish were caught on the East jetty of Shinnecock Inlet. The very end of the jetty was called The Jungle. It was before bucktails and all the fish back then were caught on a 4H Hopkins (3-1/4 oz). The only time you could fish The Jungle was the last 3 hours of the outgoing. And the best conditions were usually when the outgoing tide coincided with day break. It was an extremely productive area to fish. It was also a really rough place to fish because with an onshore wind, it would push the water onto the jetty and that would make it difficult and dangerous. This photo was taken in June of 1965. It just happened to be a bluefish morning, but many mornings were all bass. I caught a number of 40 pounders in the same location over the years. And I know my friend Greg has caught at least two 50 pounders off there. There was only enough room for four or five guys to fish there at a time. On this particular day, my friends Marvin and Greg each caught an equal number of fish. Marvin took this picture and we used his 1961 Willys Jeep to get the fish from the jetty back to the car. All of the fish in this picture were donated to a nursing home in Queens, NY. My Uncle Sol and I used to donate them all the time, so none of the fish ever went to waste. They rebuilt the jetty, and The Jungle isn’t there anymore, but that was some morning. Catching that many fish was unusual, even for The Jungle. In 1965 there were no parking permits, no campgrounds, and there were no rules or regulations. The only things there were a small parking lot and really great fishing.